This breed of cats is undisputedly one of the most unique breeds in the world. The name Ragdoll emanates from their ability to limp when picked up by humans. The Ragdoll cat originates from the United States of America, and the cat is a hybrid of different cats. It has traits of different cats such as the Persian cat, Birman cat, Burmese cat and also slight Siamese features. Selective cross breeding is what led to the large Ragdoll cat with a very humble character and a distinct limp. This occurred in the 1960s, and the Ragdoll cat was introduced in the UK in the 1980s. The cat became a favorite among many cat lovers because of its social nature and it is the only cat referred to as a ‘dog-like cat’ due to the habit of following its owners around which is usually attributed to dogs. 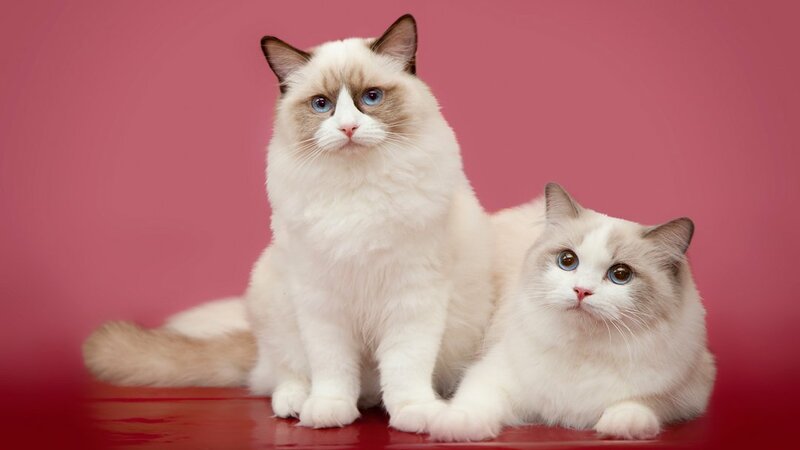 The Ragdoll is a large cat compared to other cats, and they have unique blue eyes which come from the point coloration gene. The nose, ears, paws, and tail also exhibit point coloration which makes it attractive. Ragdoll cats have a silky coat, and despite them having long hair, they do not have a dense undercoat. This has dramatically contributed to minimal shedding which in turn translates to few grooming sessions since most cats dread the hair combing and deshedding process. In addition to the color point pattern, some Ragdolls are also bicolor which means they have pure white legs and some white patches on the back. The other Ragdoll pattern is the mitted pattern characterized by a white chin. The crossbreeding led to the emergence of different Ragdoll colors such as red, lilac, chocolate, cream, and blue. Surprisingly most Ragdolls are born white and they start forming other colors from the second month and by the time they are four years they have fully achieved the right color according to the dominant color gene. When taken good care of, the Ragdoll cat can live up to 17 years. Ragdoll cats are the most loving cats, and they find it easy to interact with humans. Their friendly nature and the distinct limp is what led to multiple crossbreeding in an attempt to preserve those genes. They are child-friendly, and they enjoy playing with kids and tagging along in most of their activities. Their affectionate nature also makes it easy for them to interact with cat-friendly dogs and a pet lover can comfortably keep the Ragdoll cat and a dog in the same house without going crazy. The Ragdolls are not too energetic, and they are not lazy either. They occasionally play the fetching game and due to their gentle nature, they do not fancy rough games that will make them anxious. Ragdolls are easy going cats, and the only thing they ask is to be well taken care of. They are not fussy cats though they follow their owners everywhere. They are very quiet cats, and they rarely make weird noises to capture the owner’s attention. Ability to adapt to different environments is very important, and the Ragdolls do not have a problem familiarizing themselves with new surroundings. They are not smartest cats, but their level of intelligence is enough to help them adapt to new environments and warm up to new people. Ragdolls unique features continue to make them stand out from the other cats. Their ability to limp and pass down that trait to their kitten’s intrigues many people. In addition to that, their easy-going nature and children friendly attribute is a big plus to many cat lovers.